A roof will never be complete without an effective and efficient gutter system. And as your one-stop roofing partner, Green Air Heating and Air Conditioning can also provide you with gutters that are specifically designed to keep water away, protecting your roof and home from related moisture and water damage. Green Air offers comprehensive rain gutter services for both residential and commercial properties. Through our years of experience and training, we have known that the best way to address water damage is to prevent it in the first place–one of the ways to do that is by installing a gutter system that won’t fail you when the rainy days come. Whether you’re building a new roof and needs a reliable gutter system to go with it, or need to replace your currently dilapidated system, Green Air is here to help. Since 2007, we have been providing our best services and materials to various areas in California, such as Alamo, Antioch, Brentwood, and Canyon, as well as Clayton, Concord, and Dublin, all the way to San Ramon, Walnut Creek, and Pleasanton, among other surrounding areas. Get New Gutters from Green Air Today! Treat your roof and home to a new and efficient gutter system today! 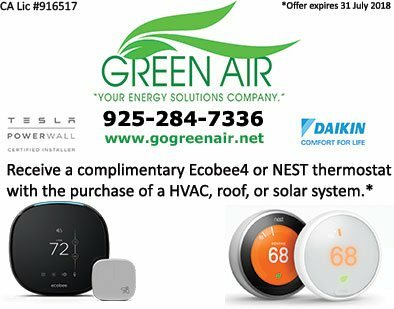 Call Green Air Heating and Air Conditioning at (925) 62-SOLAR or (925) 28-GREEN to schedule a no-obligation consultation and free estimate. You may also reach us through our online contact form.